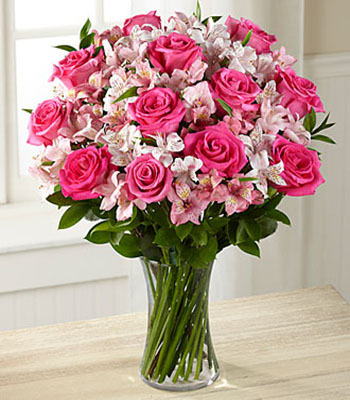 This lovely bouquet is arranged with 1 dozen roses and 10 stems of Alstormeria lilies. The beauty of roses and the longevity of lilies makes this the perfect bouquet for birthdays, anniversaries, or other special occasions. Our bouquets of roses and lilies come in a variety of colors, not just pink. Let us know what colors you prefer - depending on seasonality and availability of flowers. For fresh flower deliveries in San Diego, choose Four Seasons Flowers. Order today for same-day delivery!